The PICC line protector fitted well, small in my case, and after a few attempts became easier to put on. It is expensive but works well. I would suggest that a choice of postage rates could be offered. The item only weighed 79gms and cost £6 delivery, and in my case took 4 days due to a Bank Holiday. I ordered this after trying the cheap sleeve from another source, and being completely dis-satisfied. 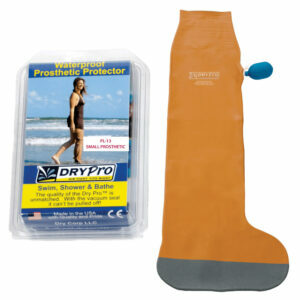 The Dry Pro, although expensive, complety covers my PICC line for baths & showers, and I’m looking forward to testing it in the sea off the Cornish coast soon! I’ve a permanent PICC line in my left upper arm for two years now as I need two intravenous infusions of saline & magnesium each week following major bowel surgery. 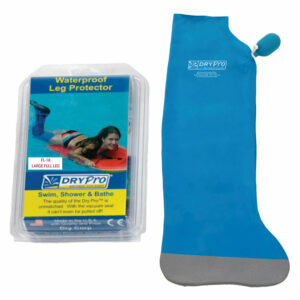 As a result I have been unable to swim, but now I can thanks to DryPro! My DryPro PICC cover arrived just before I started our holiday in Croatia where I now are and I’ve been swimming every day with no problems thanks to this excellent product – thank you DryPro! I ordered a PICC line cover having carefully measured my arm. I am a petite size 8. My measurements indicated I should order small. It arrived very promptly but was far too small. I was thinking of exchanging it for the next size. Having read the reviews I telephoned. Unfortunately I didn’t speak to the popular James, but to a woman whom I found lacking in empathy. She made it quite clear that I couldn’t exchange it but would need to reorder the new size, pay for it and in due course I would be refunded. I was so put off by her manner that I simply returned the product. I obviously hadn’t read the terms and conditions carefully and raised a query by email to which James sent a clear and friendly reply. I’m not sure whether you should go for a slightly bigger size, or if that would cause problems too. The theory is fine but the reality wasn’t successful for me. I have upper arm Piic line and everything is bone dry after showering. It is bit expensive but worth every penny. I got the first cover sizing wrong so had to order another in larger size. Quite costly. Excellent waterproof cover which makes showering more relaxing. The pump mechanism is difficult to get off one handed. Make sure you order the correct size that will be tight to your arm to ensure the vacuum works properly. I bought this cover for an upper arm PICC line, having been desparate to swim on holiday. Overall it has been excellent- definately totally splash proof, although I did not try to fully swim. Comfortable despite a tight seal, and a great way of keeping picc line fully dry on holiday. My PICC is high up my upper arm- have a look at the measurement table, but fitted as the dimensions said- for high bicep lines I would suggest as tight as possible for the upper measurement and can always be cut to make it a bit wider as needed. This made the seal as tight as possible. Cannot recommend enough and definately allowed me to join in on holiday as much as possible- brilliant. This is my second pic cover in 6yrs , without this I wouldn’t be able to shower or swim , perfect , pulling my hair out before I found this product , no one tells you about these things , glad I found it . My pic is in upper arm , best thing ever ? I have had my cover for a couple of weeks now. I didn’t trust the device at first but need not have worried. The sleeve fitted perfectly and keeps my arm and picc line dressing bone dry. At the week I choose to put the cover to the ultimate test and took my son swimming. He was careful not to pull on the sleeve and we had 100% total success. Swimming is now helping me with Physio for the surgery site and has given me back some freedom. Chemo wipes me out too much for running so swimming fits the bill for now. My only grumble would be the colour. Its no where flesh coloured and stands out when you are wearing it so what not offer it in different colours? I might have cancer but I like to think I still have style. Half way through my chemo and required a picc line as veins had given up! Although a picc line meant no more cannulas, I was very worried about getting it wet in the shower. Went online and found this product available in the UK. So thanks cast covers. It works brilliantly and the dressing remains bone dry!!! I can enjoy my showers without any worry!!! A must for any picc line patient. Initially I ordered a cover that was too loose (my measurements were borderline between 2 sizes) I emailed them and got an immediate response from James suggesting I return the original for a replacement which then arrived promptly. I am very pleased with the product which enables me to shower and bathe without any worries about getting my PICC line wet. Wonderful customer service! Brilliant product – has given me the freedom to shower and wash without any hassle and the service was amazing – ordered it on a Saturday got it on the Monday!! Purchased this product a while ago now and it has given me a new lease of life. Being able to have a bath or shower without worrying that my PICC line is getting wet is amazing. I would definitely recommend this to anyone. My PICC line is in my bicep. I ordered the small as the measurement including the PICC line was ten inches. When the cover arrived it was a little on the tight side so it was a struggle to get on. I read I the instructions that it was possible to cut the cover to make it bigger. I called the company for advice on whether to cut or to return the cover for a larger size. I spoke to James who was extremely helpful and I cut around one centimetre which then made it a perfect fit. I’ve used this in the swimming pool and even tried it out in the steam room. Each occasion the protected dressing is completely dry when removing the cover. Very happy with this product.